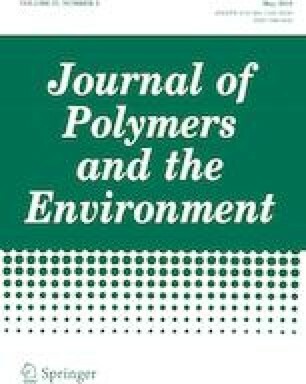 The study aimed at the production and characterization of biopolymer polyhydroxyalkanoate (PHA) by Bacillus endophyticus. The usage of refined (sucrose 2–4%) and inexpensive unrefined (sugar cane molasses 2–4%) carbon source was evaluated by varying the media components via shake flask method and batch cultivation in bioreactor. The optimal PHA production of 10.7 g/L of PHA from 15.37 g/L of cell density was obtained using 4% sugarcane molasses (SCM) at 250 rpm using optimized medium obtained through statistical experimental design. Batch cultivation with increased agitation rate and addition of feeding nutrients provided by SCM significantly lead to enhanced PHA production by the test organism by increasing the overall cell density. According to the statistical model, the increase in the sugar concentration (> 4%) by SCM had a negative effect on PHA production. Characterization by FTIR and 1H NMR was performed to confirm the biopolymer that has been produced by Bacillus spp. Authors are grateful to The Department of Biotechnology (DBT), Government of India, for sponsoring the work (PR 18430/BIC/101/703/2016) and the Department of Biotechnology, Manipal Institute of Technology, Manipal Academy of Higher Education, India; for providing the facilities to carry out the research work. The authors would also acknowledge Mrs. Subbalaxmi (Assistant Professor, Manipal Institute of Technology, Manipal) and Martin Hoiss for sharing their insight and expertise with us during the course of this research.